There is a lot that you can learn about your project by looking at a single drone map. But a single map doesn’t mean as much without context. And when it comes to a changing job site, mine, or field, the most crucial bit of context is time. You can understand so much more about what’s happening today if you know what happened yesterday — and what’s supposed to happen tomorrow to stay on track. Meet Projects: an entirely new DroneDeploy interface designed to help you better manage drone data over time. 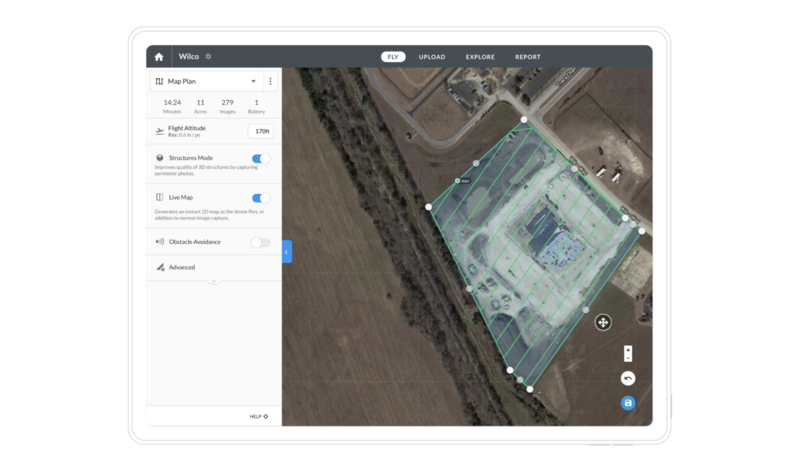 From flight to insights, it’s now easier to capture, explore, and share drone data across your organization. With the new Project UI, it’s easier than ever to organize your drone data and analyze changes over time. Projects automatically group drone data by location. This feature makes it easier to plan flights, process and explore maps, and most importantly, generate insights as time goes on. This reduces the complexity of comparing changes throughout the project lifecycle — such as stockpile volumes or building progress — saving teams time in the field and the office. Our new flight templates make it simple to capture consistent data across each job site, at any stage of your project. Create custom flight templates that can be applied to any mission, eliminating the need to copy old flight plans each time you want to fly. These templates can be stored and used by any member across your job sites, bringing greater consistency and repeatability to your drone program as you scale operations. Data isn’t powerful unless you can share it easily. And you shouldn’t have to share a map or report at every stage of a project — it’s not efficient. This is why we’ve changed the way you can communicate progress with teams. Share an individual project with a collaborator once and each time you generate a new map or report, they will be notified. You can also set permissions, including editing or viewing capabilities. It’s that simple. With Projects, your team never misses a beat. For many customers, it just doesn’t make sense to purchase dozens of DroneDeploy seat licenses. We’ve heard your feedback, and now we’re excited to announce a new site-based pricing option. Purchase a site-based license for your project to provide anyone at your organization with access to DroneDeploy for the entirety of the project. Think of it as an unlimited pass to aerial insights for an entire team. Interested in purchasing a site-based license? Contact a member of our team. Excited about Projects? Us too. The good news is that this new interface is generally available to every DroneDeploy customer starting today. Sign in to your DroneDeploy account and give it a spin. We know you’ll be impressed. If you’re not a DroneDeploy customer, don’t worry. Sign up for a 14-day free trial and try Projects out for yourself. Make sure you stay tuned for future updates to the new Projects interface. We’ve got some exciting new features right around the corner.